I am sure all of us have said something we wish we hadn’t, often times unchecked words can hurt and harm, not only others but also ourselves. So let’s try to remember to pray this prayer, or one like it,everyday when we awaken so we can live each day better because we have mouths and hearts that are guarded by the Lord. Dear Lord. 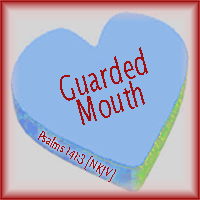 today I ask You to set a guard over my mouth and my heart. Keep me from saying, thinking or doing things I might wish later I had not. Please, Lord, watch over my mouth, lips, tongue and heart so that they will not cause others, me, or You any trouble. Thank You Lord. Amen. “Pay attention, my child, to what I say. Listen carefully. Don’t lose sight of my words. to anyone who discovers their meaning.